Norfolk Island will fascinate with its rich history, beautiful environment and friendly locals who are always ready for a yarn or two about their beloved home. You’ll be charmed and enchanted during your time on this pretty ocean outcrop. From the World Heritage-listed Kingston, with its fascinating convict history and even the odd ghost story, to the hospitality and delicious fare from Bounty descendants, there’s plenty to delight on this South Pacific Paradise. Discover the natural wonder of Emily Bay or admire First Fleet artefacts in the maritime museum. Learn about the curious mix of English and Tahitian that combines to form the utterly unique Norfolk language and venture into the homes of three Islanders for a thoroughly entertaining progressive dinner. Watawieh and welcome to Norfolk Island. Settle into your resort, your home for the next seven nights, and meet your Tour Director and fellow travellers over a welcome dinner. Norfolk Island has a colourful history spanning more than 600 years. The earliest settlers were believed to be East Polynesian seafarers who arrived around the 14th or 15th century, stayed for a few generations and then left. 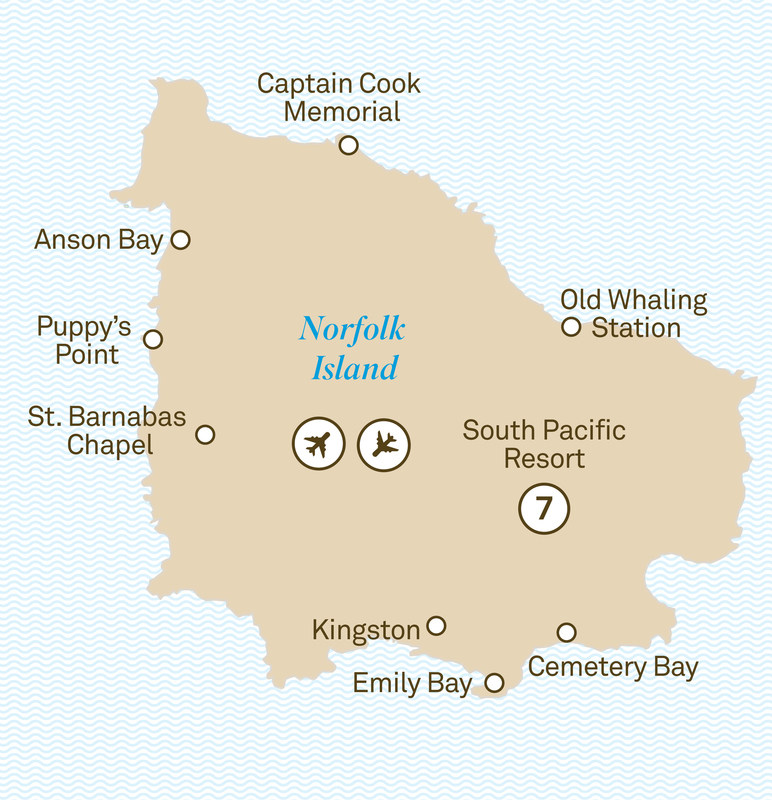 Captain Cook was the first European to encounter Norfolk Island in 1774 and described the island as paradise. Start your day with a visit to the historic Chapel of St. Barnabus before browsing the local markets. Discover the history, charm and key landmarks of the island, visit picturesque Emily Bay and enjoy the fresh sea air and crystal clear waters. Learn about the unique language of Norfolk Island, a fascinating mix of English and Tahitian, created by the Bounty mutineers and their Tahitian wives. The first prison colony was established on the island in 1788 and lasted until 1814. The island was abandoned until 1825 when an even harsher convict era began, which lasted until 1855. Visit Kingston, the World Heritage-listed convict settlement and hear stories from this time. Walk amongst the convict gaol ruins and learn about the historic and current uses of the pier buildings and other historic landmarks in the area. A guided tour of the maritime museum introduces artefacts from the HMAS Sirius, flagship of the First Fleet which sank off Norfolk Island. In the afternoon, take a garden tour of private gardens. Experience the friendly hospitality of the local community with a progressive dinner. Three different families will welcome you into their homes for each different course. The Islanders will share stories of what life is really like in paradise. Today’s choices include a glass bottom boat cruise or a visit to Two Chimneys Vineyard. Take a horse and carriage ride or self-drive yourself around this island paradise. Join the Norfolk Today tour or meet the local beekeeper as part of the Taste of Norfolk tour. Alternatively, enjoy a 4WD safari or a farm and industry tour. The setting for dinner will take your breath away. Dine on a clifftop overlooking the ocean, feasting on fresh island produce. Afterwards, be entertained by the dancers’ rhythm against the backdrop of the setting sun. Enjoy an early morning walk through the rainforest at Palm Glen and learn about the local wildlife as you walk beneath a canopy of Norfolk Island palms, followed by breakfast overlooking the beach. Later, visit the unique cyclorama which is a 360 degree panoramic painting depicting the story of the Bounty mutineers. During a visit to Norfolk Island Cottage Pottery, you’ll have the opportunity to see pots being thrown on the wheel by a master potter. See the Hilli goats being milked and have the cheese making process explained. Enjoy a beautiful tasting platter of this home-grown cheese, including locally made guava jelly. This evening, watch the ‘Trial of Fifteen’, a lively re-enactment of the history of Norfolk Island. Take part in a traditional dinner at Number 9 Quality Row before hearing some of the ghost stories that add to the mystery of this island. Discover the life of world-renowned author Colleen McCullough during a visit to her home, as part of an exclusive guided tour of the author’s magnificent property. View some of the priceless art collections from around the world. Experience high tea on the lawns at Forrester’s Court. Start with sparkling wine before enjoying a selection of savoury and sweet delicacies while taking in the vista from this cliff side location. Finish the afternoon with a tasting of locally distilled liquers. Dinner tonight is at Dino’s restaurant. Today’s choices include a glass bottom boat cruise or a visit to Two Chimneys Vineyard. Take a horse and carriage ride or self-drive yourself around this island paradise. Join the Norfolk Today tour or meet the local beekeeper as part of the Taste of Norfolk tour. Alternatively, enjoy a 4WD safari, nine holes of golf or a farm and industry tour. Tonight, enjoy a farewell dinner at the Hilli Lounge and Wine Bar.